Great timing for the new Airfix / Xtrakit / MPM Meteor; addresses lack of weapons in the basic kits; versatile configurations. 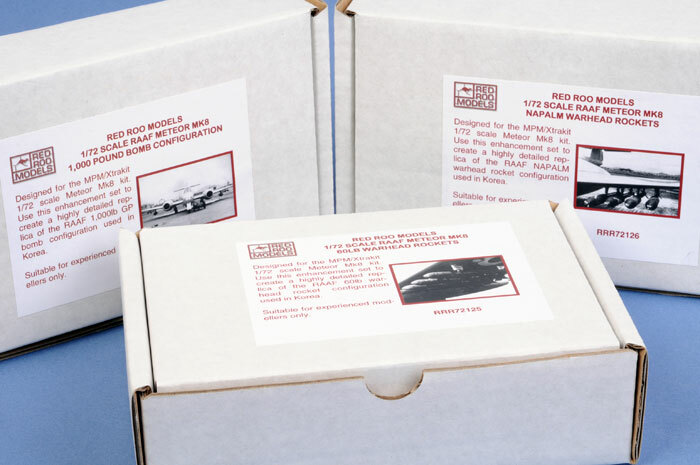 Red Roo Models has released three separate weapons sets for RAAF Meteor Mk.8s. 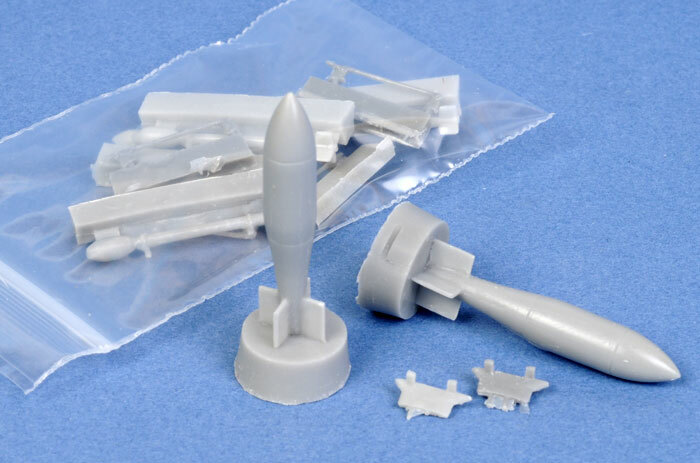 These are designed for the new Xtrakit / MPM / Airfix family of 1/72 scale Meteors, but they will be suitable for other brabds as well. The new Meteor kit is very nice, but it does not include any underwing stores. This is not especially surprising, as the detail would need to be very fine for a 1/72 scale limited run kit. Red Roo has addressed this omission with three different sets. The first is the common configuration of eight 60lb rockets. 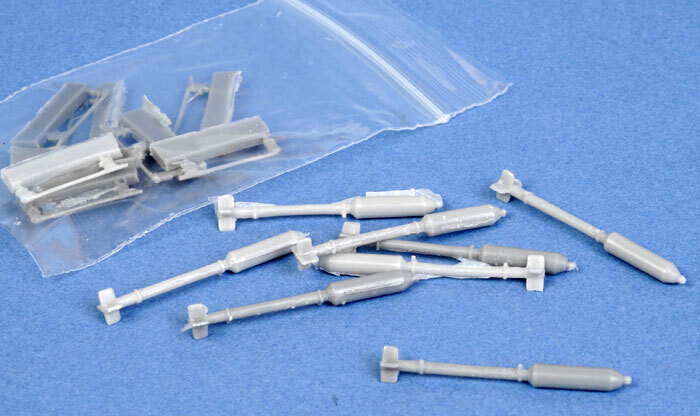 Eight rockets and eight separate rails are supplied in grey resin. This configuration will be appropriate for a wide range of operators, not only the RAAF. 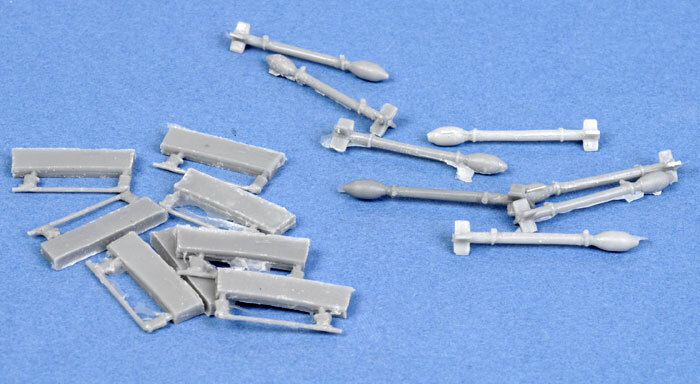 The second set offers eight RAAF NAPALM head rockets plus eight separate rails. These rockets featured a distinctive large warhead and were often used by RAAF Meteors during the Korean War. The final set provides two RAAF 1,000 lb GP bombs plus four 60lb rockets and rails. This ground pounding combination was also used by RAAF Meteors in Korea. All three sets are cast in grey resin and detail is very fine. There is quite a lot of excess resin to clean up, and there are a few minor imperfections to fill before assembly. Some care will be required as the rails and rocket tubes are very delicate. Instructions are right up to Red Roo's high standards with full descriptive text, assembly diagrams and reference photos.